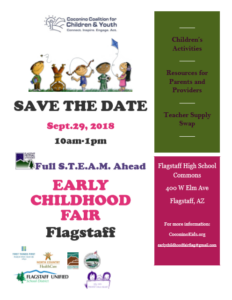 Save the Date for the Early Childhood Fair, September 29, 2018! This year’s theme is Full S.T.E.A.M. Ahead! This fair will be held at Flagstaff High School Commons from 10am – 1pm. There will be children’s activities, resources for parents and providers, and a teacher supply swap!